Risotto and rice in the Italian territory. Today, Italy is considered the paddy field of Europe for its considerable cultivation of this cereal. especially the region of the Po Valley between Piedmont and Lombardy. As well as the province of Ferrara in Emilia Romagna, and Veneto with the province of Verona and the Polesine. Another important region for the cultivation of rice is Sardinia, in the Campidanese plain near Oristano. The risotto is undoubtedly a traditional Italian dish, and perhaps one might think of a medieval origin. But this is not the case, as risotto is a fairly recent dish that follows the arrival of rice in our country. So eating an excellent risotto, our mind could linger for a few seconds on the history of this beloved cereal. We all know that rice dates back to very ancient times and very distant countries. In China, it was already cultivated for food purposes from the 6th millennium BC, as well as in India. In ancient times, rice passes from Mesopotamia and arrives in Egypt, where the Greeks and Romans discover it and begin to use it. But being a very rare product, it was very expensive. In fact, it was used as a medicinal product or to improve the appearance of the skin! As a result, in the West, only between 1250 and 1300 rice is grown as food. And only since 1400, it has a further spread, just before the discovery of America. We do not know how exactly rice arrives in Italy. The hypotheses are two: it was brought by the Arabs in Sicily or the Aragonese in Campania. For sure the diffusion of this precious cereal starts from the South where rice was used as food. But its cultivation was very difficult due to the scarcity of water in the territory. In the Middle Ages, cities were hit by the plague and famine, and it is in this context that the rice began to be cultivated also in northern Italy. There was an urgent need to meet the food shortage. As a result, from the second half of the XV century, the rice fields spread throughout the northern part of Italy. But this first intensive cultivation has troubling consequences for the population. At the beginning, they used stagnant water in rice fields for the cultivation. As a result, this method generated the proliferation of the Anopheles mosquito. Which led to the spread of malarial disease to anyone working in the rice field or living nearby. Unfortunately, at that time there was no knowledge on how malaria was spread, and the rice was blamed. The consequence was the destruction of entire rice fields. It took three hundred years to discover the real culprit of this epidemic, the Anopheles mosquito. And the solution was the use of running water instead of the stagnant one. Fortunately, during that long period, the cultivation of paddy fields continued where permitted, far from the populated centers. If the first enemy of the rice was a mosquito, the second was a parasitic fungus called brusone that mainly destroyed the rice plants. The only solution to combat it were grafts with Asian plants, much more resistant, which followed one another until 1924. 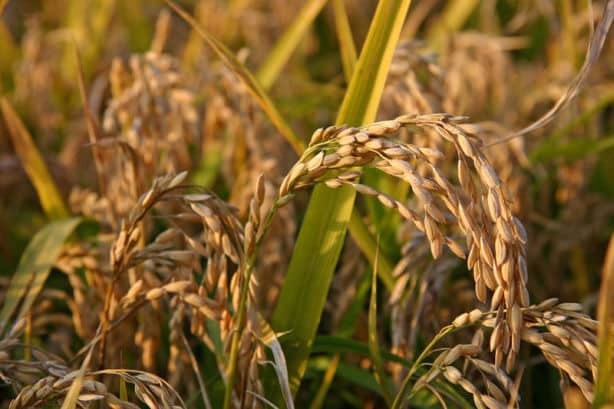 This is the date assigned to the birth of the rice called the original, which erased all previously existing varieties. In conclusion, the rice we eat today has nothing to do with the rice imported in the Middle Ages! Since the 15th century, despite the reaction on this cereal, rice was now part of the most widespread diet. In the kitchen, it was cooked in soup or by absorption, putting it together with water in the pot. 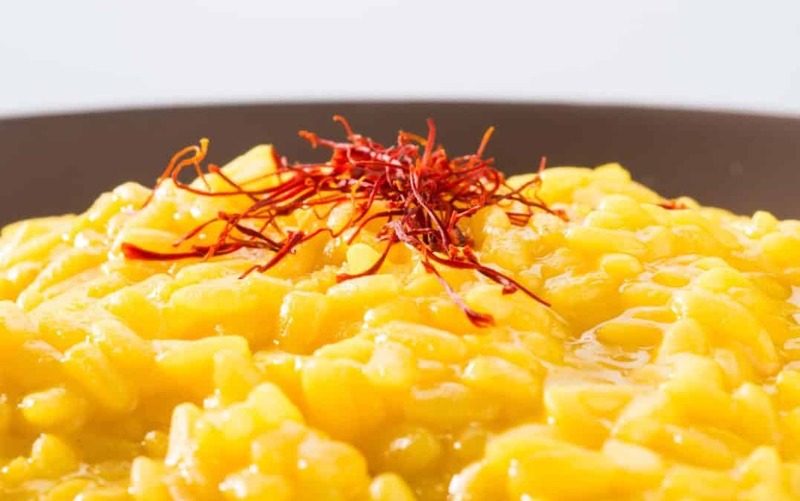 Only in the 16th century, we find an example of risotto as we know it today, that is the Risotto alla Milanese or Risotto with saffron. History tells us that the Risotto alla Milanese was born in the house of a master glassmaker who worked on the project of the Cathedral of Milan. We are in the second half of the 16th century, and it was normal to mix colors with saffron to make them brighter. For the wedding of the master’s daughter, one of his collaborators proposed to the chef to add saffron in the rice during cooking. As a result, the dish had acquired the color of gold, a symbol of wealth, prosperity and aesthetically pleasing. A real success! But only since the nineteenth century, the risotto spread from Lombardy to the rest of Italy, most of all in the north. This cereal can be perfectly adapted to the different ingredients between one region and another. Even between one town and the other while maintaining a universal basis for everyone. But what is the ideal rice for Risotto? The Japonica of the Oryza sativa species is the one that gave the origin to all the varieties grown in Italy. And it is the one that releases more starch in the cooking of rice grains and therefore more suitable for the preparation of risottos. Common rice: with a short and round grain, it tends to fall apart during cooking. Rich in starch is more suitable for desserts and soups. Among the varieties, we remember the Originario and the Balilla. 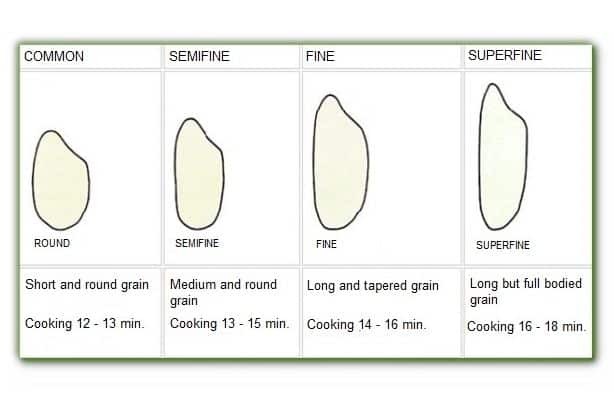 Semifine rice: with medium and always round grain, more “solid” and suitable for our risottos. Among the varieties, we find the Vialone Nano. Fine rice: with long and tapered grain, low in starch, it can be used for risotto. But it is certainly more suitable for timbales, pilaf and boiled rice. Superfine rice: with long but full bodied grain, it is the most suitable for risotto. And it is considered one of the best Italian rice. Carnaroli is one of this variety. Which is the most suitable variety for risotto? Carnaroli: the king of the risotto, with ideal consistency as it retains the smells very well, and resists creaming without falling apart. Born in 1945 from a cross between the Vialone and the Lencino. Vialone nano: its characteristics are similar to Carnaroli although belonging to the category of semifine. It has slightly smaller and round grains. Originally from Verona, it was the first Italian rice to obtain the PGI recognition. Its declared characteristic is that of being cultivated in areas irrigated with resurgence water. Baldo: a relatively new rice, born in 1977 from a cross between species of Arborio in the territories of Vercelli, Novara, and Pavia. It has an excellent ability to absorb seasonings, and the release of starch is perfectly balanced in cooking the risotto. It is considered the new competitor of the Carnaroli and is increasingly requested even in the most refined kitchens. Arborio: until a few decades ago it was the number one variety for risotto. Today it has been “dethroned” by the previously described varieties. The grains are full-bodied and pearly; they can absorb water up to five times their weight. It is still suitable for risotto, as long as it is creamy and rich in seasoning. And now choose the right rice for your Risotto!